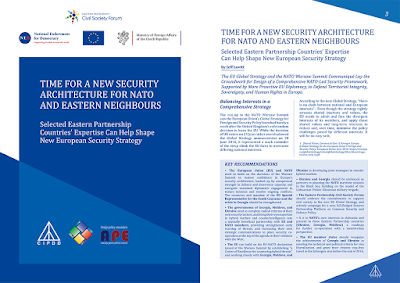 As NATO member states are about to gather for the NATO Warsaw Summit on 8-9 July 2016, the Caucasus Institute for Peace, Democracy and Development (CIPDD) has published three country studies to complement the overview study, Security Alert on the EU's Doorstep: Strategies for Strengthening Security in the Eastern Partnership Countries, which was presented at a roundtable event hosted by the Polish Institute of International Affairs (PISM) in Warsaw on 21 June 2016. The three country studies, edited by New Diplomacy Chair, Jeff Lovitt, look at the security threats and challenges facing respectively Armenia, Azerbaijan and Georgia – the three countries of the South Caucasus all face challenges concerning their territorial integrity, all with complicated relations with Moscow. ARMENIAN NATIONAL SECURITY: Drivers and Determinants of a ‘Small State’ Strategy by Richard Giragosian, Founding Director of the Regional Studies Center (RSC), Armenia. GEORGIAN SECURITY: The Enemy at the Gates and the Enemy Within by Tamara Pataraia, head of the European and Euro-Atlantic Co-operation Program at the Caucasian Institute for Peace, Democracy and Development (CIPDD), Georgia. AZERBAIJAN’S SECURITY PERCEPTIONS: Old Challenges with New Faces by Zaur Shiriyev, Academy Associate at the Royal Institute of International Affairs (Chatham House), UK. There is a need for a communications strategy to better define and defend core European ideas and values, designed to articulate what European ideas are and what they are not. And in the face of an increase in Russian “soft power” throughout the Eastern Partnership area, there also should be a focus on more effectively and more consistently reiterating the concrete and practical benefits of European integration for the average Armenian citizen and the ordinary consumer. In the reasonable anticipation of a likely renewed Russian attempt at “informational warfare”, there should be a preparatory move to pre-empt and prevent such an effort by exposing the inaccuracies and outright deception used in Russian propaganda in Armenia. The EU has prudently offered Armenia a rare second chance at rebuilding and restoring a higher degree of relations. This process should not only continue but, in the light of the April 2016 combat and clashes over Nagorno-Karabakh, should also be expanded to incorporate more of a security-related element to the new Armenia-EU legal framework. This security agenda could include measures related to “soft security,” including energy security (especially nuclear safety), disaster prevention, risk mitigation and crisis management, but also cybersecurity and other more advanced and innovative measures. The government should strengthen crisis prevention and crisis management capacity by embracing and prioritising the EU proposal set out in the 2015 review of the European Neighbourhood Policy on enhancing co-operation on security sector reform, and introducing new co-operation mechanisms between security sector institutions and the EU. The government should also work actively in the international arena to open access of international stakeholders to the territories of Abkhazia and South Ossetia, and to counter the Russian policy of distancing Georgia’s international partners from engagement in the resolution of protracted conflicts. The government and Euro-Atlantic partners should proactively work to counter anti-Western and anti-EU perceptions in Abkhazia and South Ossetia through innovative, international programmes to engage the local population. The government should also develop an effective strategic communications policy to counter Russia-led propaganda. The government should work together with EU member states to ensure that they recognise that Georgia has met the technical and political requirements of the Visa Liberalisation Action Plan, and grant citizens of Georgia visa-free travel to the Schengen area in the summer of 2016. Georgian civil society should support the idea of a new Eastern Partnership Platform on Common Security and Defence policy (building on the establishment of the CSDP panel in Platform 1), and make every effort to place the issue of security high on the agenda, and to ensure serious policy reforms are put in place in the country. The OSCE Minsk Group needs to revive dedicated efforts towards a framework agreement to the Nagorno-Karabakh conflict, including adherence to the Madrid Principles based on the Helsinki Final Act, reducing the scope for manipulation and misinterpretations. Initial steps should be followed by confidence-building measures, including a prisoner swap between Armenia and Azerbaijan. The role of the EU Special Representative to the South Caucasus and the crisis in Georgia – to contribute to a peaceful settlement of conflicts in the region, including the crisis in Georgia and the Nagorno-Karabakh conflict – should be re-energised..
NATO-based co-operation on critical energy infrastructure should be considered a top priority. The existing format of co-operation, staff-based training, should be upgraded to a new level so that not only Azerbaijan, but also Georgia, will benefit from enhanced security protections. Independent media and civil society must be supported and strengthened, in order to increase their capacity to advocate for transparency and accountability of governance, and to be involved in policy reform. The papers were produced in the framework of the project Security Alert on the EU’s Eastern Doorstep by the Caucasus Institute for Peace, Democracy and Development/CIPDD (Georgia), in partnership with the Foreign Policy Association (Moldova) and the NGO Promotion of Intercultural Cooperation (Ukraine).